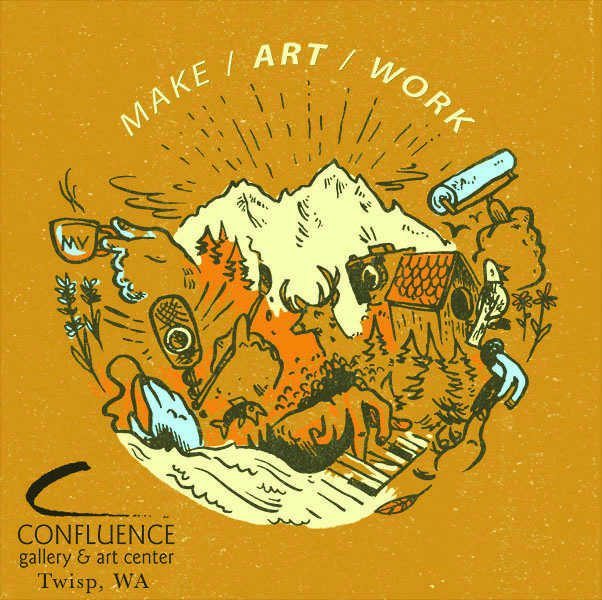 Make / ART / Work is a day-long professional development conference focused on the unique needs of Okanogan County artists. The event will feature skill building workshops geared toward artists of all disciplines and at all levels of their career. Local and regional instructors will offer practical methods to help artists implement art business strategies into their everyday work. Registration for the full conference is offered at a sliding scale $0-45. Artists from other locations are welcome to attend. Sessions will be taught by local and regional art professionals including: Artist Trust, Seattle Art Museum, VMG Studios, Gallery One Visual Art Center and Confluence Gallery. The community is invited to join our artists for an evening reception at Confluence Gallery 5:30 – 6:30 pm and a free “Powered by PecheKucha” performance at the Merc Playhouse that will explore “The ART Journey” at 6:30pm.